Der Artikel Jizzy Pearl Of Love / Hate: All You Need Is Soul wurde in den Warenkorb gelegt. The unmistakable voice from one of the most loved hard rock bands of the early 1990’s is returning this May. 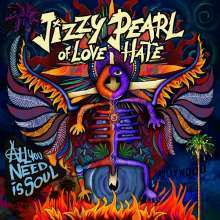 Jizzy Pearl of Love/Hate is back with his new solo album ›All You Need Is Soul‹. From the opening vocals of blistering first song ›You’re Gonna Miss Me W hen I’m Gone’ to the effortlessly cool album closer ›Mr Jimmy‹, Jizzy’s new record is brimming with fresh new music that’s easily recognizable whilst contemporary in its delivery. Listen closer and you’ll discover the hard-rocking groove of ›High For An Eye‹, the funk rock of album title track ›All You Need Is Soul‹ and many more new favorites. Make no mistake, Jizzy Pearl has returned and he’s better than ever. Jizzy Pearl and Love/Hate burst onto the scene in 1990 with the debut album ›Blackout In The Red Room‹ and proceeded to take the UK by storm with Best Album of the Year from Kerrang! and Metal Hammer magazines. Playing sold out shows and opening for Skid Row, AC/DC and Dio put Love/Hate on the map. MTV hits ›Why Do You Think They Call It Dope‹, ›She’s An Angel‹ and the band’s follow up album ›Wasted In America‹ has ensured a loyal following to this day.